If an external provider offering networking services has been registered in the Manager, the networks provided by that provider can be imported into the Manager and used by virtual machines. 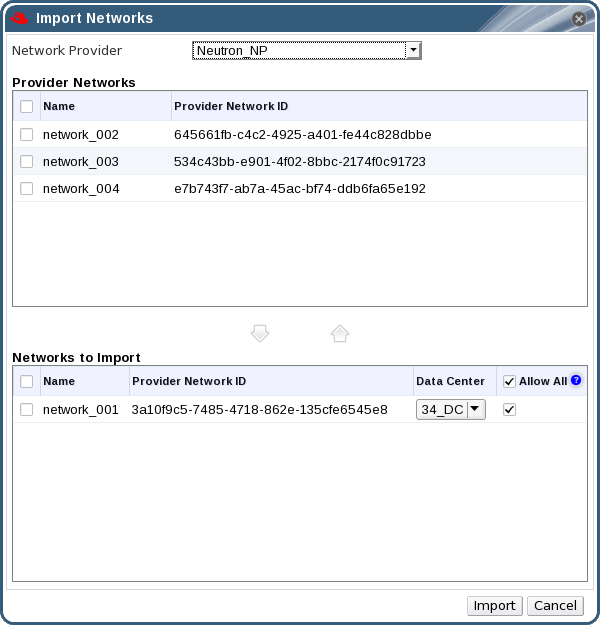 Click the Import button to open the Import Networks window. It is possible to customize the name of the network that you are importing. To customize the name, click on the network's name in the Name column, and change the text. Optionally, clear the Allow All check box for a network in the Networks to Import list to prevent that network from being available to all users. The selected networks are imported into the target data center and can now be used in the Manager. External provider discovery and importing are Technology Preview features. Technology Preview features are not fully supported under Red Hat Subscription Service Level Agreements (SLAs), may not be functionally complete, and are not intended for production use. However, these features provide early access to upcoming product innovations, enabling customers to test functionality and provide feedback during the development process. The following limitations apply to using logical networks imported from an external provider in a Red Hat Enterprise Virtualization environment. You cannot edit logical networks offered by external providers in the Manager. To edit the details of a logical network offered by an external provider, you must edit the logical network directly from the OpenStack Networking instance that provides that logical network. Logical networks imported from external providers are only compatible with Red Hat Enterprise Linux hosts and cannot be assigned to virtual machines running on Red Hat Enterprise Virtualization Hypervisor hosts. A logical network provided by an external provider can only assign IP addresses to virtual machines if one or more subnets have been defined on that logical network. If no subnets are defined, virtual machines will not be assigned IP addresses. If there is one subnet, virtual machines will be assigned an IP address from that subnet, and if there are multiple subnets, virtual machines will be assigned an IP address from any of the available subnets. The DHCP service provided by the Neutron instance on which the logical network is hosted is responsible for assigning these IP addresses. While the Red Hat Enterprise Virtualization Manager automatically discovers predefined subnets on imported logical networks, you can also add or remove subnets to or from logical networks from within the Manager. Click the logical network provided by an external provider to which the subnet will be added. Click the Subnets tab in the details pane. 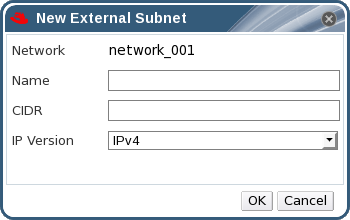 Click the New button to open the New External Subnet window. From the IP Version drop-down menu, select either IPv4 or IPv6. Click the logical network provided by an external provider from which the subnet will be removed. Click the subnet to remove. Click the Remove button and click OK when prompted.